If you share our vision to improve children’s car safety in 2018 join us in making these 5 simple pledges this new year. Starting now will turn them into a habit. It’s not just chatting on your phone that can increase the likelihood of a crash, it has been shown that even the briefest interactions can prove a substantial distraction. Unfortunately, the only sure-fire solution is complete and total avoidance of your mobile devices when driving. This subject is very close to the heart of BubbleBum founder Grainne Kelly, who has created a pioneering road safety campaign called I Love You Enough which is empowering children to ask parents and other adults to pledge not to touch their mobile phone while driving. Visit the I Love You Enough website and make the pledge yourself. Such campaigns have great potential to help improve children’s car safety in 2018, and for years to come. We sometimes have to remind ourselves that the speed limit is an absolute maximum rather than a target. There are times when driving at the posted speed limit will be perfectly appropriate, but on the same road, with less favourable lighting or weather conditions, the opposite can be true. It’s important to remember that not all roads are created equal and that authorities use a standardised method to decide which limit goes where. This kind of system will never be able to accurately reflect the diversity of road conditions you’ll be faced with, especially in a country like the UK and Ireland where motorways flow into a labyrinth of winding country roads and hedge-lined lanes. If we all make an effort to drive in accordance with road conditions this year, it will certainly be possible to make a big impact on children’s car safety whether they are pedestrians or passengers. It’s fair to say that when we were kids there was a pretty ‘relaxed’ approach to children’s car safety. Fortunately, there have been many great efforts to increase public awareness of the dangers of travelling on our roads, and most of us now feel pretty well informed. Having said that, we’ve all encountered a situation that tests our dedication to road safety. 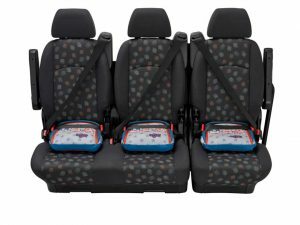 Picture the scene; a child needs to be taken a short distance from A to B, but there is no car seat or booster on hand. It’ll probably be fine to just buckle them in, and drive really REALLY carefully… right? The frightening statistic is that 90% of crashes happen within the first 10 minutes of the journey. Yes, everything might go to plan, but equally, there is a chance that something could go very wrong; no matter how carefully you drive, there are others on the roads, therefore, there’s a limit to how much you can control. Without the proper restraints, a child can be very seriously injured from a crash, which might otherwise have left them unscathed. It’s not a risk worth taking, so in 2018 make appropriate children’s seats a hard and fast rule in your vehicle. BubbleBum inflatable booster seats can be helpful in fulfilling this pledge because they make it possible for any child to carry their own booster seat wherever they go. When deflated, BubbleBum booster seats can be rolled tight and tucked snugly into a backpack, and because they weigh just 500g, they are easy for children to carry. They will also easily fit into a handbag or a glove compartment, so it’s easy to ensure there is always one on hand, should you need it. Most people are vigilant about their own in-car safety these days, and many would never dream of setting foot in a vehicle without putting on their seatbelt. Where we are today marks a revolutionary shift from the situation just a few decades ago, and it’s important that we pass on our diligence to the next generation, by making sure they never see us be blasé about our own safety. Remember, a seatbelt under the arm or behind you is not a seatbelt fitted correctly. Pledging to set a good example for your children in 2018, will help carry on the good work which has already been done, and further enshrine the importance of car safety for generations to come. If you’ve ever been involved in a crash, or even had to stop very suddenly, you will know that the sheer force involved in such rapid deceleration is incredible, and perhaps much more intense than you had previously imagined. In such a situation items such as mobile phones and even a box of tissues can become projectiles, hurtling forward towards you or your children with life-threatening power. The amount of damage that even a light item can do even at low speeds is incredible, and these effects are multiplied if the car is travelling at a higher speed. Many people don’t realise the danger that unsecured items pose in the case of a crash, but the solution is very simple; store bulky items in the boot where they won’t be in danger of causing serious injury to you or your children and store other smaller items in the glove compartment or door wells. We hope that you will join us in making these pledges to improve children’s car safety in 2018. We would love to hear some of your children and family-related pledges for 2018, let us know on Twitter or Facebook, where you can also keep an eye out for discounts and giveaways!